The Hunab Ku is an ancient symbol filled with mystery due to its mixed ties. Some associate it with the Mayans, others consider it to have Aztec roots, and others still believe in the strength of its Christian ties. The earliest reference to this term that we know about appeared in the Diccionario de Motul, where “Hunab Ku” translates to several things: Sole God, Only God, etc. According to this text, there was only a single great god in the eyes of the people of Yucatan. However, he had no distinct form, as he was not a being of simple matter. This god was considered to be the true source of all energy. The term “Hunab Ku” symbolism also appears in the Book of Chilam Balam of Chumayel, which was written after the Spanish Conquest. It has not been found in any pre-Conquest inscriptions in Mayan writing. However, it is still believed to be an ancient Mayan symbol. Sylvanus Morley even asserts that Hunab Ku was a name for the Mayan high god in his classic book, The Ancient Maya. Another scholar, Jose Arguelles, has claimed that this term represents the principle that life is bigger than our mere surroundings. It reaches beyond us and even further beyond the cosmos. 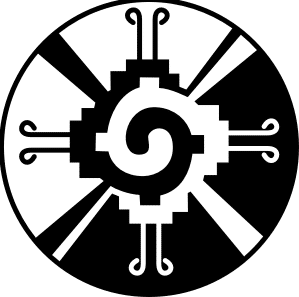 What we know for sure is that the Hunab Ku symbol can be found illustrated in the original Mayan calendar system. As such, we can interpret the symbol as pertaining to the cycles that occur in nature and in human lives. It depicts the oneness, order, and balance that exists within the universe, and reminds believers that god is an omnipresent force with infinite power. This god facilitates the movement of energy throughout life, but we also have responsibilities as inhabitants of the Earth to take care of her. The most common theme amongst all of nature is that balance is crucial. This is also the major symbolism associated with the Hunab Ku, regardless of what specific religion anyone wishes to follow. The Hunab Ku can be equated with the yin and yang symbol found in the Asian traditions. The concept of balance is a broad one when it comes to the Hunab Ku meaning. It can be applied to nearly every aspect of our lives, however. Most generally, the world experiences a balance every year, every season, and every day between light and dark, day and night. This speaks directly to the connection, relationship, and understanding between the sun and the moon. They compromise with one another and do not feel the need to outshine the other. Each is given its due time and consideration, as are the symbols and animals associated with them. Our families manage the balance between male and female, paternal and maternal energies and parenting strategies. Likewise, the male and female energies of the world (whether in people or in animals) also maintain a balance, completing their own specific roles and complementing each other’s features. Less popularly but equally as common examples of the inevitable balance in nature include those of good and evil and life and death. Although they might not be glamorous, they are real and true. Each of these things only contributes to the cycles that make life beautiful. Symbols gain a plethora of meaning over time. Sometimes, they even gain attachments that are not fitting or are not supported. We cannot know every detail of the pre-written written history of a symbol, but this is OK.
You are given jumping off points for your own personal explanation of the symbol, which is much more useful and appropriate for your own needs anyway. When any aspect of a symbol speaks to you personally, listen to it. There are no wrong ideas if they are your own.